From “Felicity” to “The Unit” to “Scrubs” to “Grey’s Anatomy” to “True Blood” to “Scandal,” Scott Foley’s television career has been an extensive and varied one. It’s been standard practice for some time now that prominent film actors, writers and directors have turned to TV for more creative outlets. That leaves the playing field open for those with long careers in TV to take a dip into the indie film world. Enter Foley, whose feature film directorial debut is the dark comedy “Let’s Kill Ward’s Wife,” which follows the dark and twisted tale of a group of friends whose murderous fantasies of killing off their pal’s spouse turn into an accidental reality. Indiewire caught up with Foley right before the holidays, while his current TV escapade, “Scandal,” was on hiatus having left certain viewers (and Indiewire writers) in the lurch with its cliffhanger kidnapping of Olivia Pope (Kerry Washington). Though he is making the press rounds to talk up his first feature film, the charming Foley had no qualms revisiting some of his old TV haunts and indulging this fan in a bit of TV gossip. “Let’s Kill Ward’s Wife” is now available on VOD and is in select theaters tomorrow, January 9. Oh my gosh, you’re aging us both, Casey. [laughs] I appreciate it, it’s still one of my all-time favorite shows. Just to let you know, I was always on Team Noel. Is that right?! I’m so glad! It’s amazing how many people come up to me and they’re like, “Hey, I loved ‘Felicity.’ You were such a loser. I was so Team Ben.” And I think like, oh, that’s kind of a compliment. Yeah, but you know, teenage girls go for Ben because he’s the bad boy, but then they get to be like 25, 30 and they want a Noel. And you realize like, oh my God, Ben’s still single and drunk and Noel is decent. I agree. So let me jump to the film. I’m not going to lie, the premise of it is a little disturbing. How did you come up with this idea? It is a little disturbing. And before I say anything, we knew going in that some people are really going to appreciate and love and laugh at, and some people are going to find it offensive and disturbing. We knew that you can’t please everyone all the time. But I had this sort of concept a little while ago when all of my friends were getting married and my relationship with them was changing. Then someone said to me, “I recently lost a good friend. He got a ring caught on his finger.” And I thought, well that’s an interesting idea. When you become an adult, it’s harder for men to make friends, I think, than it is for women. I had been through the process of having some close friends and then getting married and us sort of losing touch. So I started to write this film and it just sort of took on a tone that I didn’t intend for it to take! [laughs] But one that, when I sat back a read it, I kind of liked. I gave it to some friends who got the tone, and we set about to take this thing off the ground. Was the idea of writing your own screenplay or directing a film something you had always wanted to do? It’s been a process. I love the industry that I’m in. I love what I do and I’ve sort of grown from being an actor and being on set. I take it all in and I talk to the grips and the Best Boys and talk to lighting guys. I talk to everybody and see what they do and pay close attention. Because of that I ended up directing an episode of “Felicity” and a couple of other things, “Monk” and “The Unit.” Along the way I’ve had some great people to look up to, some great people that I’ve respected. People like J.J. Abrams and David Mamet, Shawn Ryan and these people who could tell these amazing stories. I thought I’d give it a shot. But making a film was not something that I necessarily ever had a long term plan to do. It sort of came about organically. I wanted to take the reins myself and see what I could do. The cast is full of your close friends, so did you have them in mind when writing? I wrote this without anybody in mind, but I’m lucky enough to have been in this business for a long time so I have a bunch of friends. I’d do anything for them and vice versa. I’m also married to an actress [Marika Dominczyk] and her family is comprised of actors, so not only is my wife in the film, but so is my sister-in-law [Dagmara Dominczyk] and my brother-in-law Patrick [Wilson] is in it. Greg Grunberg who you obviously know from “Felicity” and Donald [Faison] who I worked with on “Scrubs.” They all fit these characters really well, and they’re all people that I knew would be game for doing this. It really was a passion project for everybody involved and not something that everybody got paid for up front. People got paid like 100 bucks a day because the union said we had to. And they’re all people that I knew would be ok to not have a trailer and sit on a cooler in a kitchen in a house waiting to shoot and people that I’d want to spent that time with. So that was really important to me as well. You’ve directed a bunch of TV before, but this was your first film. Did you have any expectations going in? Did anything surprise you? I was terrified. I was completely terrified going in. It’s a huge undertaking. I know, just from directing television, where you have a huge support system of producers and writers and a script supervisor, not just the cast but a crew of 100 people, there are, as a director, hundreds of questions that you have to answer every day. Going into this, knowing that I didn’t necessarily have much, if any, of that support system, was a very daunting task. But at some point you just have to roll up your sleeves. I look at the industry and I think, well if that person can do it and that person can do it, I at least have to give it a shot. So I was terrified about the whole thing, especially with our limited budget, I had a lot of restrictions put upon myself. Not just location wise and prop wise, or costume wise, but mostly for me it was with regards to equipment and the camera. We had no dolly so there was no way to move the camera, so I had to be very specific in my staging and blocking my scenes in order to keep them alive while keeping the camera still. It was a challenge but one that I think added to the tone of the film. Did you consider not also acting in it yourself, or was that one of your restrictions, that you had to play double duty? No I didn’t think I was going to act in it at all, and when we came down to the casting process, we were looking for people we knew would add something to the cast. There are a whole lot of decisions you have to make when you’re casting things. You have to think about selling the film later, and these days social media or who has a large social media following s you can push it out there. When we were all talking about it, I sort of became the guy to go to for a whole bunch of reasons, the least of which was my acting ability. [laughs] But I think it worked out well. I don’t know if I’d do it again. It was one too many hats to wear. There are a couple of fun film references in it. There’s mention of “The Shawshank Redemption” and then “Fargo.” Do you consider yourself a cinephile or film geek? I do! I do consider myself a film geek. I love television and film. Any time that I can pull for one of these films that I really like, I do it. What films did you draw inspiration from? This was a tough one for me, inspiration-wise. I watch a lot of films and the tone of this is really unlike too many out there, especially with the dry, dark humor. I watched “Very Bad Things” years and years ago and really liked it but didn’t think that much about it when I was writing this. But as soon as everyone started to read the script and they mentioned that film to me, it completely made a connection and obviously had some sort of influence on me while I was doing this. But there are not that many films with this, for better or worse, [laughs] this sort of tone. Can you think of anything out there that has this sort of tone? The only thing I can think of is E.L. Katz’s “Cheap Thrills.” It’s got this comedic tone but it’s really dark. Probably a bit darker than yours. But it’s got a few bloody moments, similar to your film, but I think you guys have tapped into a budding genre. That was the only other other film that popped into my head. I’m going to have to check that out because I’m very interested to see how other attack this sensibility. Because it was really difficult for us to get the tone right. And I think we did it, but some people are going to get it, and some people are not going to get it. One of my other favorite things in the world is “Scandal.” Have you found that your fans, particularly your female fans have stuck with you since “Felicity” and now through “Scandal”? It’s amazing what social media has done for entertainment. I have always been fortunate to have, obviously because of “Felicity,” these female fans. And I’ve been involved in a number of shows that have these sort of followings. Through “Scandal” specifically, I’ve found or heard from so many more fans because of Twitter and Instagram and social media in general, because they can now interact directly with me. The amount of people that I hear from that are huge Noel fans, or watch “Felicity,” or didn’t like Noel, or couldn’t believe that she didn’t end up with Noel at the end, or love “Scandal” is amazing and intimidating at the same time. These fans are everywhere. There are so many of them. And I’m a fan, I’m on Twitter like talking to people hosting HGTV programs and telling them I love their show. It’s an amazing time we’re living in right now. The fans are the reason that we’re on the air. The quality of television has increased over time as well. Is that something you’ve noticed within the characters you’ve played? Absolutely. It’s been amazing. I’ve always liked doing television because I like a 9-5 job. I like getting up and going to work and I hate that feeling of looking for the next job, and television to a certain degree does that for me. But, I think people are realizing what I’ve found to be the case for the last 15 years, is that some of the best writing out there is on television. I’ve watched a bunch of film screeners that the guilds have sent me this season and there have been a lot of great movies, but I will happily tune in to “The Affair” or “The Americans” or “Game of Thrones” over a lot of these films because the writing is just so superior. I think writers and producers are realizing that it’s an amazingly adaptable and creative medium and I think networks and cable networks are realizing that if they give these talented people the freedom to do so, the quality is just going to be amazing. I have kids and I watch so much TV once they’re in bed that I am exhausted every morning. I can’t get enough and I’ve been lucky, between “Felicity” and “The Unit” that David Mamet wrote with Shawn Ryan, and now “Scandal.” So there’s just great stuff out there and talented people who can tell these stories while limited to 60 minutes. On network they have 22 episodes to tell these stories and it’s a really demanding gig for these writers but the writing is just amazing. Any clues you can give me about “Scandal” and what’s going to happen with Jake and Olivia? I’m on Team Jake too, by the way. I don’t know what is it with you but Team Jake over Team Fitz. Thank you, we had a ton of fun doing that. At some point you have to put aside any fear you have, like the song says “Dance like no one’s watching.” I think there’s a possibility that we’ll see Fitz and Jake team up to find their girl. I’d like them to explore more of the friendship between Jake and Fitz and how that all came to be and what it really means to them and what it’s going to be in the long term. 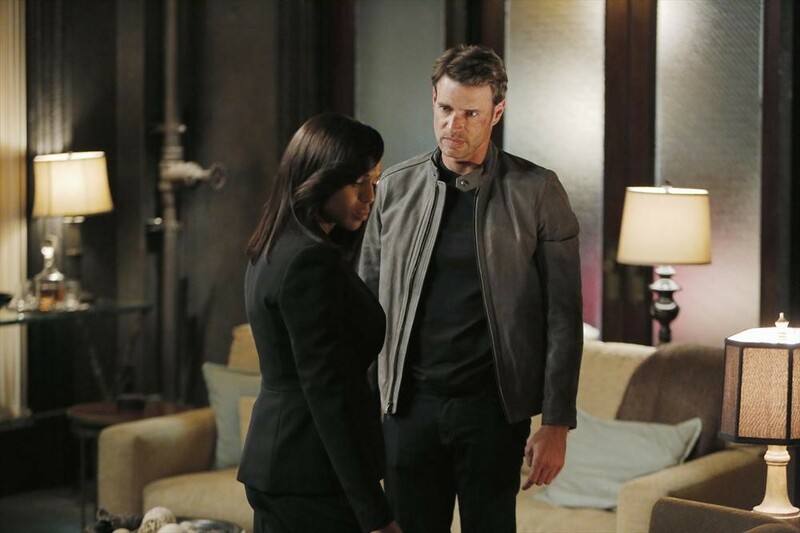 Will Olivia get in the way? Keep watching you’re going to love it. Do you have any plans to write or direct again? Yeah, nothing imminent, but I learned a lot doing this film, both good and bad and I think that I can take that knowledge and, as proud as I am of this film, I can make another one. I’d like to make something that’s a little less genre-based. I have a couple of ideas I’m kicking around. I love this process and this business and to be able to hopefully have the freedom to do another one would be great. Well have fun and keep going. Oh I will, I’m hooked. And I just recently caught up too, I devoured it in like a month and a half. Yes! That’s the amazing thing too about television now, even though “Scandal” is sort of must-see TV, you don’t need to watch it that night. I watched “House of Cards” in like two days, it’s amazing. It’s such an incredible time for television.